Gail Anderson isn’t asking you to make a new best friend. that’ve never been in a mosque before—then I think we’ve done something,” said Anderson, unity and relationships organizer with the Minnesota Council of Churches. Anderson helps head up the interfaith project “Taking Heart,” which brings Muslim and non-Muslim neighbors together over good meals and good conversation. The next event, set for May 14 at Masjid Ummat Muhammad, was designed for South Minneapolis residents. The program is scheduled to begin at 6 p.m. with two presentations: There will be a brief talk about Muslim prayer, and Anderson will discuss the Christian prayer tradition. Afterwards, free Middle Eastern food will be served, and people will be encouraged to mingle and talk. But what if people self-segregate, and Christians sit together with Christians, and Muslims with Muslims? “We don’t let ’em,” Anderson said, and laughed. Taking Heart organizers won’t let participants eat in silence, either. There will be note cards with discussion-starters at each table. Because the theme for next Wednesday’s event is prayer, the questions will be on that topic. Wednesday, May 14, 6–8 p.m. Taking Heart, sponsored jointly by the Muslim-American Society (MAS) and the Minnesota Council of Churches (MCC), was the brainchild of Hesham Hussein, the former head of MAS who died earlier this year. After 9/11, local mosques and churches hosted a number of interfaith events where people could learn about theological issues. That type of event worked for some people, Anderson said. The Taking Heart initiative began 2004. Since then, some of its regular participants have worked in a soup kitchen together; others have visited the office of Rep. Martin Sabo. Taking Heart participants also held a solidarity march that went from a mosque to a church. And, in September 2005, a group of Muslims and Christians wrote a joint letter to the editor. The biggest challenge in organizing Taking Heart events is not convincing Christians that it’s a good idea to get to know their Muslim neighbors. Anderson sees the Taking Heart project as still in its “beta testing” phase. But once they’ve worked through the kinks, she said, the group would like to take the project to Minnesota universities, colleges, and workplaces that have significant Muslim populations. South Minneapolis residents are encouraged to bring themselves and their neighbors to the Taking Heart dinner on Wednesday, May 14. The dinner is set to begin at 6 p.m. at Masjid Ummat Muhammad on 315 East Lake Street in Minneapolis. Information about the Taking Heart project from the Minnesota Council of Churches. 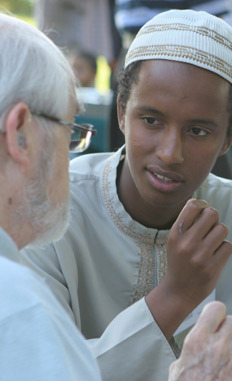 A list of Minnesota interfaith resources. More about the Muslim-American Society of Minnesota. A map that shows the location of Masjid Ummat Muhammad. Marcia Lynx Qualey works at the University of Minnesota. She also writes and raises two sons. Posted on May 11, 2008, in interfaith and tagged church, dialogue, Events, Gail Anderson, interfaith, interfaith dialogue, Marcia Lynx Qualey, Masjid Ummat Muhammad, Minnesota Council of Churches, mosque, Muslim American Society, prayer, relationships, Taking Heart, terrorism. Bookmark the permalink. 2 Comments. Thank you for bringing this to the attention of the public. Efforts like these are the glue that binds the communities together.